With an old unused frame, a little spray paint, a few tools, and some help from Mother Nature, I made myself a jewelry rack last week. I can’t take credit for the idea, since it was mostly inspired by this one that I found on Pinterest. 1. Find an appropriate wood picture frame and remove the backing and glass. Lightly sand the frame to rough up the finish, wipe off the dust, then spray paint with several thin layers. 2. Find dry branches and use a saw to cut them to a size that will fit in the back of your frame. (If you don’t have a saw, pruning shears might also work). 3. Screw cup hooks into your branches at even distances apart. I used the 3/4-inch size. 4. Using small nails, attach your branches to the back of your picture frame with the cup hooks facing the front and upright. 5. 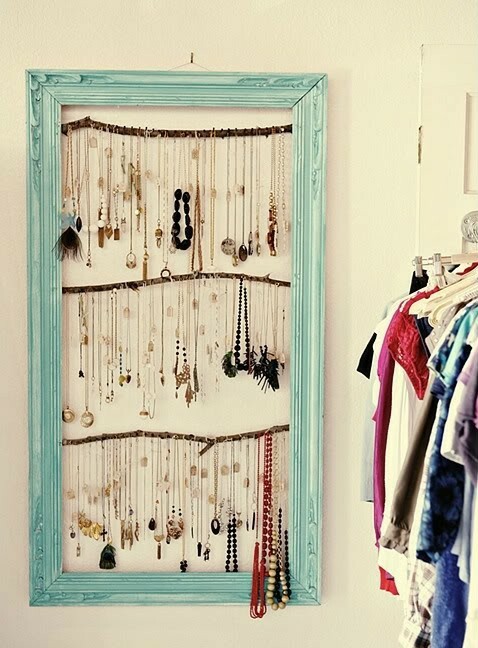 Hang it up and add jewelry! I adore this rack, i am def making this my weekend project! thanks for sharing!! Thanks K, so glad you like it! Hope yours turns out well. So far I love it because I can finally see all of my necklaces! My only question is, how did you hung the frame on the wall? Thanks Kelly! I just hung it on a nail with a standard picture frame hanger bracket…not sure what those are called, but any regular frame hanger will work.